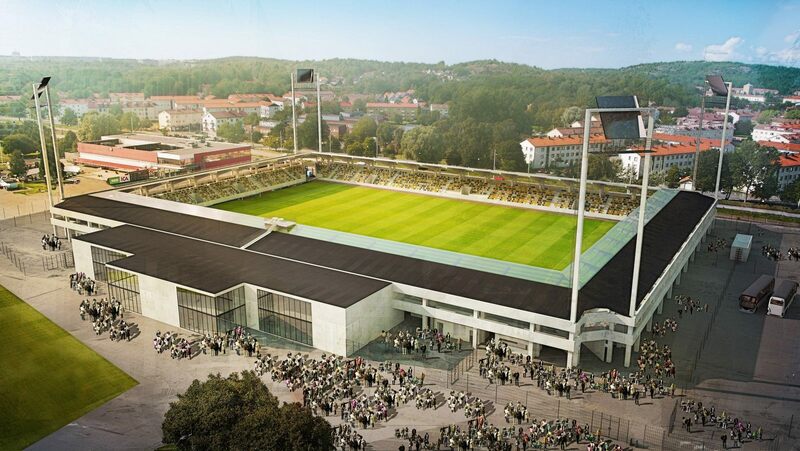 At first sight simple, maybe even unimpressive, this stadium in north-western Goteborg is very well thought-through and original in its design. Concrete dominates both inside and out of the stadium, being the main material used in stands, the roof and even floodlight masts! This unique devotion to one material is caused by local weather conditions – proximity of the sea would make any steel elements extremely prone to rust. Floodlight masts are among the world’s most interesting. Aside from their concrete build and height of 39 meters (almost 4 times the stadium’s height), the masts are practically shaped into rectangular frames to minimize any swinging when withstanding strong winds. Also, to prevent the roof from blinding nearby high-rise residents with reflected sunlight, the stadium’s roof will be kept dark and mat. Wind and salty air weren’t the only difficulties of the site – 500 piles had to be installed before foundation works could start to stabilize the muddy ground. And planning wasn’t easy with a very tight plot restricted by roads. However the steep stands are big enough to hold 7,000 people (1,400 standing) and even expand to 8,000 in the future. Construction was launched in the spring of 2014 and is due to end in the summer of 2015. 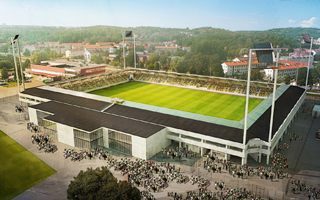 Price estimations suggest the stadium alone will cost €16 million. If you think this new stadium is ordinary, think again. 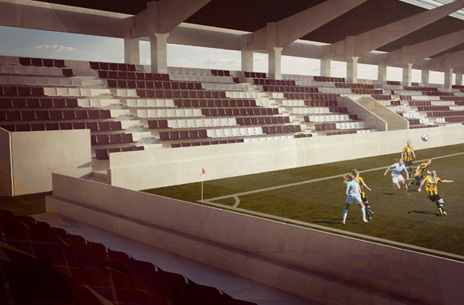 Here not only the stands, but even roof and floodlight masts are made of concrete. And it gets more interesting – it’s modern, meets all criteria, but is also cheap and fast to build.